Get your creative juices flowing at historic Tom Collins House as we flit and fly with words and ideas this Saturday from 1 to 5pm. Many fine poems and startling stories have been begun in these sessions. No great experience in writing is needed, so all comers are welcome. Simply bring paper and pen. $22 for 4 hours, plus tea and biscuits. What more could you ask for? 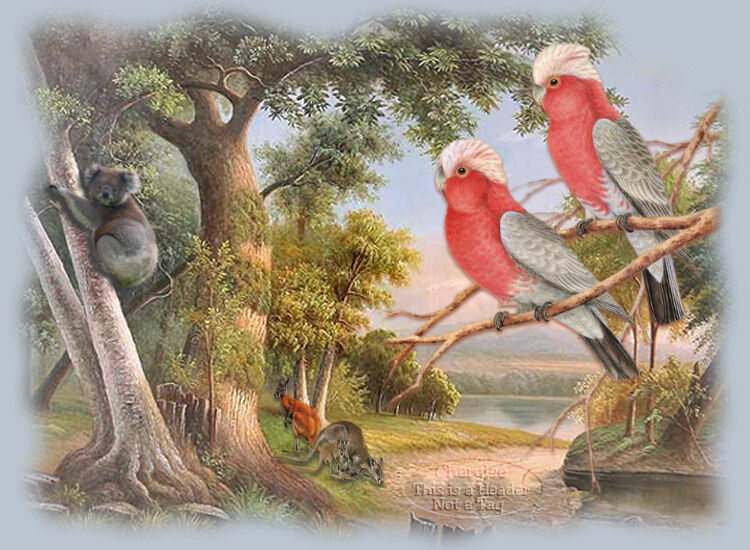 Presented by myself for the Fellowship of Australian Writers, WA section. “In Poetry I have a few Axioms,” wrote John Keats in 1818, in one of his famous letters. $50,000 Poetry Prize in Montreal - for a single poem! The organizers of a new literary prize announced on Thursday they will award $50,000 to a single poem. “The launch of such a large prize for poetry obviously marks an important moment for anyone interested in literature,” said Michael Harris, a poet and member of the prize’s editorial board, in a press release. To be eligible for the prize, the poem must be written in an English dialect and be 40 lines or under. Andrew Motion, former poet laureate of the United Kingdom, will select the winner. The $50,000 prize purse is a gift to the Montreal Prize from a donor who wishes to remain anonymous. “We were lucky to find someone generous and forward thinking enough to kick-start this project with a catalyst donation. And we are currently seeking a sponsor or patron for future years,” explains Peter Abramowicz, one of the Montreal Prize’s three founders. There’s a catch; if you want your work to be considered for the $50,000 prize, you have to pay an entree fee. Each entry will cost you between $10 and $20, depending on whether you live in a “developing nation” or a “developed nation” and whether you enter early or late. Apparently, “your participation helps to make the Montreal Prize a reality!” For real? As well, the 50 finalists will be featured in an anthology published by Véhicule Press. But wait! If your poem isn’t good enough to make the top 50, don’t fret. The next 100 “best” poems will be published in another anthology, to be released in e-book form by Véhicule Press. The deadline to submit an “early” entry is April 22. The final date to enter is July 8. The winner will be announced in December. Young poets wearing new spring fashions - in Oprah! Sneer all you like, but Oprah's love of Poetry is nothing to sneeze at - the woman has amazing media power and maybe can raise the level of poetry awareness to a new and higher level. Her book club has proved to be more intelligent than expected, using the talents of critics like Francine Prose. Take a look - the Punk look was my favourite, although the one above is eye-catching (and probably arm of chair catching, etc). The Reason-Brisbane Poetry Prize was established in 2004 as part of the Words in Winter Celebrations that are held, each August, in towns across Hepburn Shire in Central Victoria. In 2010, the competition, initially for Victorian residents only, was opened to all Australian residents. The Prize has been generously sponsored by Joy Brisbane, a published poet and author who understands the difficulties poets face when trying to find outlets for their work. Joy’s aim is to encourage and nurture the talent of both new and established poets. With a total prize pool of $2300 the Reason-Brisbane Poetry Prize continues to be one of the most lucrative poetry competitions in Australia. In 2011 the first prize will again be $1500, second prize is $500 and third prize is $300. The judge for 2011 is Melbourne poet Petra White, whose first book of poetry, The Incoming Tide, was shortlisted in the Queensland Premier's Literary Awards. She was a 2008 Fellow of Hawthornden Castle International Retreat for Writers, and her second collection, The Simplified World, was published by John Leonard Press in 2010. 2010: 1st place Kevin Gillam; 2nd place Barry O’Donohue; 3rd place Andrew Slattery. Shornbag: a particularly attractive naked sheep. "In 1999 the Arts Council of England commissioned a report into the state of poetry. Rhyme And Reason, which ran to more than 180 pages, made for uncomfortable if predictable reading. Few people admitted ever to buying a poetry book and those who did said it was more likely to be by a dead poet than a live one. Contemporary poetry accounted for 3% of sales of verse, 90% of which were claimed by one publisher (Faber) and 67% by one poet, Ted Hughes. Pam Ayres was named as the nation’s fifth favourite extant poet, beloved by women and the over 45s." You and a guest are warmly invited to join us on Thursday 24 March 2011 from 6pm to celebrate the opening of The Negativity Bin: a joint launch of works on paper by Ipswich artist Jodie Weller and local Woodend poet, B.R. Dionysius’s latest chapbook, The Negativity Bin. 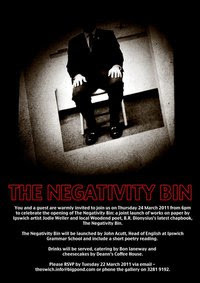 The Negativity Bin will be launched by John Acutt, Head of English at Ipswich Grammar School and include a short poetry reading. Mexican poet Octavio Paz asks a very important question here: why do people work hard to distinguish between life and poetry? Paz's works deal with a new kind of metaphysics, one focused not so much on human potential and life force, but on the life forces that flow in and out of the world. Paz shows that the aim of poetry should not be to perpetuate a static artform, but to create new life and vivacity. Joe Morello was born on July 17, 1928, in Springfield, Mass. Having impaired vision since birth, he devoted himself to indoor activities. At the age of six, his family’s encouragement led him to study violin. Three years later, he was featured with the Boston Symphony Orchestra as soloist in the Mendelsohn Violin Concerto. At the age of twelve, he made a second solo appearance with the orchestra. But upon meeting and hearing his idol, the great Jascha Heifetz, Joe felt he could never achieve “that sound”. 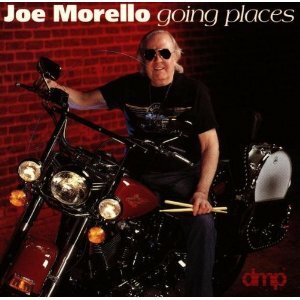 So, at the age of fifteen, Joe changed the course of his musical endeavors and began to study drums. PS: When I was a teenager, I learnt drums and taught myself Morello's solo on Take Five by the Dave Brubeck Quartet. Their enormously successful album Time Out was a huge influence on my early music taste. This excerpt from Eliot's famous essay expresses the belief that good writing engages all of the writing that comes before it, and that good writers understand the lineage of literary ideas and movements. Through knowledge of the past, a writer does a better job of expressing ideas of the present. Having heard Paul Harrison read his dark, witty and iconic poetry at slams, poetry-gigs, backyards, loungerooms and car-parks around Perth over the last few years (as well as over the phone, in txt messages and backseats of cars) - it's almost impossible not to hear his rich voice, the thick Irish cadence - as I consume this collection of his poetry. Published by Coral Carter's gutsy - and very new - little Western Australian publishing venture: Mulla Mulla Press, meet me at gethsemane is a collection of over 30 poems, some previously appearing in various zines and online publications. It's difficult at times to remember that this is Harrison's first book. The poems spill down the page with inherent readability. His economical, reflective phrasing, the deliberate poetic intention, the bold lack of pretension is honest. Brutal. Powerful. These poems are complex nuggets of simple language - all presented in lower-case text, no punctuation - just clever use of white-space and enjambment to carry an image, an emotion, a reflection. Each poem stands alone, in solid skeletal punch, yet somehow marries the next, and the next and the next one - perhaps conjoined in the bitter taste that permeates the book's 68 pages. Short sharp bony bursts of well-crafted punch. Harrison shares hard tales of mental asylum inhabitants, too-many cigarettes smoked, raw emotions spat, drugs and regret and self-reflexive anger. The way he writes is the way he speaks. This is not avant garde, process-driven, experimental wankery - Paul's well-written narrative carries each piece, allowing us to fully realise each moment shared. This is the poetry of isolation and despair. This collection finds little hope in the human condition, and certainly no love for the malicious capitalist culture we share. 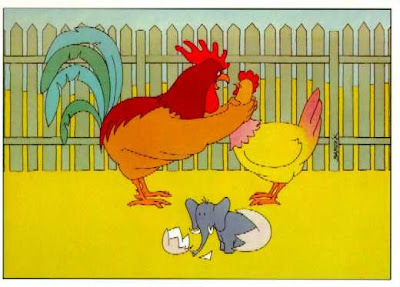 Peppered throughout though, there is a wicked, dark humour and a gift for subtle description. And whilst the darkness flows within these pages, there is fragility and even a hidden beauty amongst this work. 1. All entries should be in English using one side A4 paper, typed, double spaced in size 12 font. 2. All entries must be accompanied by a signed entry form (photocopies accepted). Do not attach the entry form to your work. 4. Copyright remains with the author. Entries will not be returned and will be destroyed after the announcement of the results. 5. Peter Cowan Writers Centre reserves the right to publish without payment the Winning, Second place, Third place, Highly Commended and Commended entries in its E-Magazine. 6. Multiple entries are allowed, in which case one cheque or money order is acceptable to cover all entries. Cheques or money orders should be made payable to ‘Peter Cowan Writers Centre Inc.’ Do not send coins, stamps or cash in the mail. 8. All entries must be post marked by the due date. Late entries will not be considered. The judge’s decision is final and no correspondence will be entered into. Details of the presentation will be published on the Peter Cowan Writers Centre’s website and at the July Monthly Meeting. If you wish to receive a results slip and judge’s report, please include a stamped, self-addressed envelope. Declaration: I certify that the work I have entered in this award is my own, is unpublished, will not be offered for publication before the 3rd of July and has not won recognition in any competition. By entering this award I agree to my work being published without payment on the Peter Cowan Writers Centre E-Magazine if I finish among the first eleven entries. I understand that copyright will at all times stay with me, the author of the work. I have read the conditions of entry into this award and agree to abide by them. The form of the mountains – his pure body. In the morning, how will I explain them to others? AS THE first Aboriginal author to win the Commonwealth Writers' Prize for best book in south-east Asia and the Pacific, Kim Scott would be entitled to feel some extra pride. 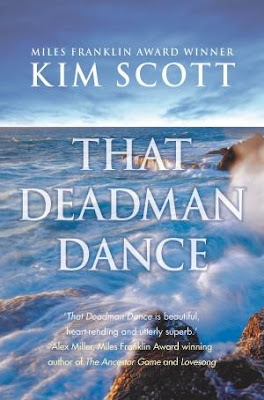 Scott's winning third novel, That Deadman Dance, is about the harmonious relations between his Noongar people of south-western Australia and the early settlers. 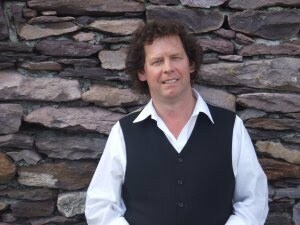 On Saturday 5th March, Perth Poetry Club presents, for your delectation and enjoyment - all the way from Ireland – the award-winning and highly entertaining poet TONY CURTIS. Tony will perform at The Moon, 323 William Street, Northbridge from 2 to 4 pm, in two sets. There will be open mic. as always. TONY CURTIS was born in Dublin in 1955. He studied literature at Essex University and Trinity College Dublin. An award winning poet, Curtis has published six warmly received collections. The most recent ‘The Well in the Rain: New & Selected Poems’ (Arc, 2006). In 2003 he was awarded the Varuna House Exchange Fellowship to Australia. Curtis has been awarded the Irish National Poetry Prize. In 2008 ‘Days Like These’ (with Paula Meehan & Theo Dorgan) was published by Brooding Heron Press. A new collection ‘Folk’ has just been published by Arc. Curtis’s new book of poems for children ‘An Elephant Called Rex’ may be ready in time for his visit to Australia. He is a member of Aosdána, the Irish Academy of the Arts. "One of the jobs of poetry is to make the unbearable bearable, not by falsehood but by clear, precise confrontation," he has said. Mr. Wilbur has met that challenge by holding himself to the strict, outmoded view that what can't be described well maybe isn't worth writing down. When? 10am-12 noon Wednesdays for 7 weeks starting TOMORROW 2 March 2010. Where? Tom Collins House, Swanbourne. This course is for beginning poets and those with some experience. Explore contemporary poetry writing in a friendly group setting with experienced poet Janet Jackson as your guide. With a series of writing activities, exercises and experiments we will release our poetic voices, finding inspiration in our surroundings, in other texts and art, and in randomness. We will discover and invent new connections and ideas. We will learn about form, content, voice, address and imagery. We will explore the music of words, how poets make them sing, sigh and cry. We will also learn about editing and improving our poems to make them more beautiful, more satisfying and perhaps more publishable. Participants will receive a booklet with example poems, information about techniques and activities, further reading and resources. 1. Participants will explore poetry writing through a progression of writing activities and techniques and by reading and hearing poetry from various periods and genres. 2. Participants will have opportunities to write in ways they may not have previously tried. 3. Participants will come away with drafts and ideas for new poems. 4. Participants will learn ways to improve their drafts by editing. 5. Participants will discover some of the resources available to poets locally, nationally and internationally. Presented by Janet for the Fellowship of Australian Writers WA (FAWWA).